Ninth graders at Avenues School in Chelsea have made red, white, and blue nylon bags from Frank Benson’s discarded “Flag” multiples; we invite passersby to make their own FLAG BAG. The Frank Benson flag installed on our school rooftop is a contemporary art landmark in Chelsea. 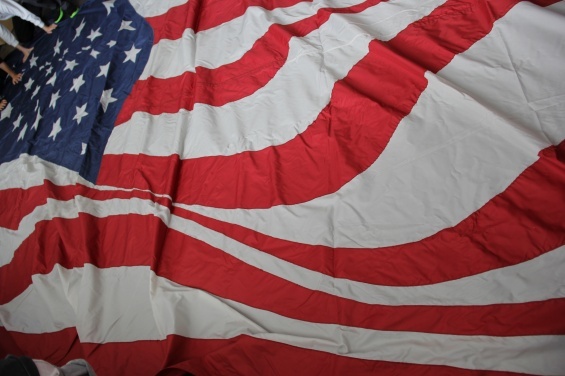 The Art Now students, a group of contemporary art–focused ninth graders, have two flags ready for reuse. Our Art Now course is greatly influenced by the New York art world and its institutions. Collaborations with the Whitney Museum, Pace Gallery, MoMA, and other institutions, including galleries in our own Chelsea neighborhood, as well as visiting artists, have all enriched our curriculum. We aim to learn about art-making and engage with the community beyond the classroom walls. Our students are focused on important issues like untapped capital in creating their own works of art that are socially, economically, and environmentally responsible. Each term, we pursue a project with a contemporary artist that incorporates reuse into its concept. Frank Benson’s work, alternative modes of presentation, and focus on product were intriguing to us. We invite the public to make their own FLAG BAGS. The eighteen students in the Art Now class will be helping to construct these bags in different sizes and for use in various contexts. We hope to support contemporary art and to demonstrate a clever reuse of an iconic contemporary work as a functional object.